The Emerald Tablet of Hermes Trismegistus is one of the most mysterious, cryptic and enigmatic texts. The text is actually derived from the Hermetic tradition - an ancient Greek and Egyptian philosophical texts which are attributed to the mysterious figure known as Hermes Trismegistus. The texts are a combination of the Egyptian god of wisdom, Thoth and the Greek god Hermes. In these texts, Hermes discuss with his disciples, the true nature of the cosmos, nature, the mind etc. These teachings can be found in the ancient texts of the Corpus Hermeticum. 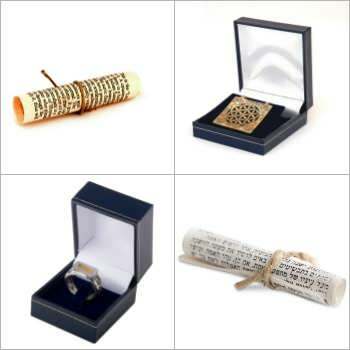 These texts are dated back to the 2nd and 3rd century AD and their origin is probably Egyptian. 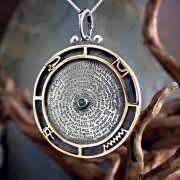 The Emerald Tablet is the most famous piece of Hermetica and is said to contain the secret of the Prima Materia - the base of all matter and existence which is formless and beyond definition (that is the reason for the endless similes in the Alchemical language). 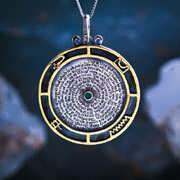 The Prima Materia or the Aether is also described by the ancient alchemists as the Anima Mundi or the “World Soul”. It is the soul, or oneness that connects everything and IS everything. When I came to designing this text as a pendant I’ve decided to incorporate all of it’s Greek and Egyptian origin in my design with the ancient Alchemical similes. On the front side, the outer “frame” is composed of the four classical elements (water, air, earth and fire) and I’ve used the ancient Egyptian hieroglyphs for each one of them. 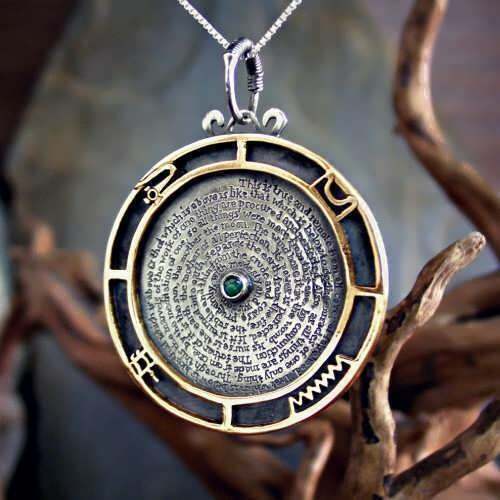 The center of the pendant is set with an emerald stone and the whole structure of the pendant, the circle with the point in its center is actually the ancient symbol of the Monad. The term Monad comes from the Greek word "Menein" which means "to be stable" and from the Greek word "Monas" which means "Oneness". The ancient Greeks called the Monad – the base, the essence, the foundation and the builder. 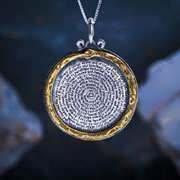 The ancient Pythagoreans believed that nothing can exist without a center and that the existence revolves around the center. The center is the source that cannot be grasped or understood but can spread and become a circle. 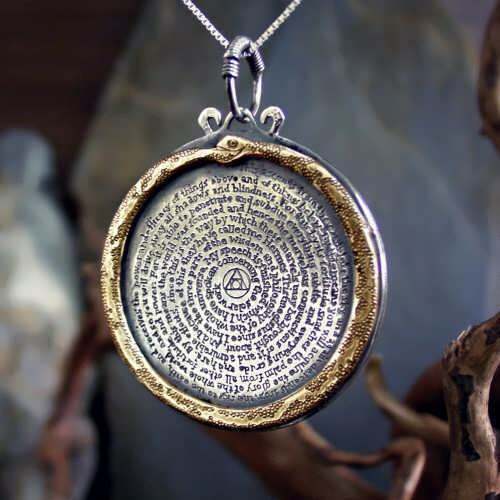 On the back of the pendant at the outer circle is, of course, the ancient symbol of the Ouroboros which in Alchemy represents also the Prima Materia, and the constant change and transmutation of matter and the universe. 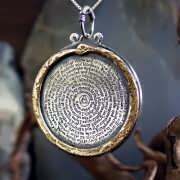 At the center of the back of the pendant appears the ancient symbol of alchemy.